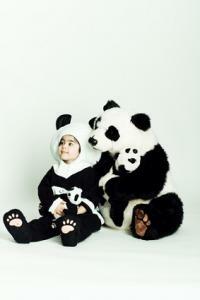 Tom Arma costumes offer distinctive, high-end designs for babies and small children. Tom Arma has been called "the most published baby photographer in the world." He began his career as a teenager as the youngest staff photographer at the New York Daily News, moving from news to celebrity features, but eventually left the world of journalism to develop his own studio. His first baby picture appeared on a 1972 magazine cover, and he was hooked on these young subjects. In 1990, he designed the animal costumes for a popular series of posters and greeting cards called "Please Save the Animals," and since then his unique costumes have been as popular as his photography. Tom Arma costumes have been featured on television and in print, in everything from seasonal magazine covers to zoo promotions. Pictures of babies in the costumes are available in books, posters, and prints. Tom Arma's costumes are similar to Anne Geddes' artwork in the sense that they pair a baby's face with stuffed animal looks. The body of each costume is built like a sleeper. Large feet, tails, and other extensions are added as necessary. The heads of the costumes are hood-like. They fit closely and frame the face so it becomes the animal's face. The costumes are carefully constructed from quality materials. Unfortunately, this creativity and quality come at a price. Most of Tom Arma's creations retail for $50-$60. On the plus side, Tom Arma costumes are popular enough to be able to recoup some of the initial investment by selling them the next year. If you're the crafty sort, you can save some money by making your own costumes from a popular series of patterns from McCall. Unfortunately, they seem to currently be out-of-print, so you'll have to hunt for them. The Flower - The sleeper part of the costume is all green, so the baby's body becomes the stem. For the hood, a large ring of pink petals frames the face, leaving your smiling baby as the center of a daisy-like flower. The Frog - A green and orange sleeper with a green hood and giant orange eyes forms the base of the costume. The most distinctive feature is definitely the large webbed feet! The Black Cat with a Pumpkin - Any baby can be a cute-as-a-button kitty with a smiling jack-o-lantern. A black bodice and attached pumpkin makes this costume adorable. A baby won't truly appreciate any costume, let alone distinguish between a Tom Arma costume and a onesie from a discount store. These costumes are all about the photo opportunities and having a chance to show off your little one to friends and family. Whether you choose a dinosaur or a butterfly, the costume is almost guaranteed to elicit a chorus of awws. Order your favorite Tom Arma costume early - the most popular designs can sell out as Halloween approaches. The costumes cover so much of a baby's body, they could potentially become uncomfortably warm. Keep a close eye on your little one to keep him or her comfortable. As with most designer products, imitators abound. 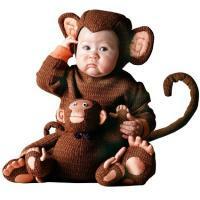 For instance, this monkey costume is similar in design to the Tom Arma Monkey but sells for about $20 less. When buying online, watch out for copycats. Some sellers have made costumes using the official patterns meant for personal use, while others try to slide by with similar costumes they hope buyers won't examine too closely.